"Our friend is in there, lost and alone!" Disney-Pixar has debuted a new trailer for their upcoming animated sequel Finding Dory, directed by Andrew Stanton and co-directed by Angus MacLane. 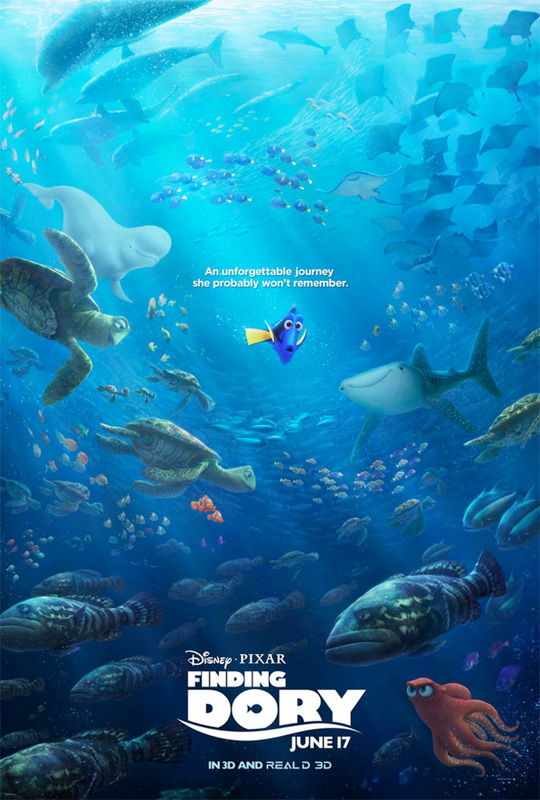 Everyone is back for this follow-up, including Albert Brooks as Marlin, and Ellen DeGeneres as Dory, with plenty of new voices like Idris Elba, Michael Sheen, Dominic West, Diane Keaton and Kaitlin Olson. This new trailer is much more emotional and reveals large amounts of the story, and it really looks wonderful. The opening hints at where the movie begins and the story about Dory looking for her family. The rest of it takes place at the aquatic center, where Dory befriends an Octopus named Hank. I really really can't wait to see this, Pixar is better crafting the emotional core of their movies than just about any other animation studio. You can still see the second trailer for Finding Dory here. Follow @findingdory and stay tuned for more. We already know that the story is going to follow Dory (Ellen DeGeneres) and Marlin (Albert Brooks) on a journey to find the former forgetful fish's family. Eugene Levy and Diane Keaton have already been named as Dory's parents Charlie and Jenny, and there's also a beluga whale voiced by Ty Burrell. And Pixar president Jim Morris also revealed to Omelete that a big part of the film will take place at the Marine Biology Institute of California, a huge rehabilitation complex for marine and aquarium life. Dory discovers that she was born and raised there, only to be released into the ocean when she was young. Finding Dory is being directed by Pixar veteran Andrew Stanton (Finding Nemo, Wall-E, John Carter), and co-directed by Angus MacLane. Disney-Pixar will release Finding Dory in theaters starting on June 7th this summer. I've never been a finding Nemo fan. But I know friends who loved it literally. Inside out didn't shake my soul either. I found it quite conventional. Premise was great, but the final product looks half baked. I had two "minor" issues with HTTYD 2: 1- Which mother can abandon her family to take care of dragons ? 2- Did the villain use black magic to tame these huge dragons ? Alzheimer is not a joke. Especially when it affects a clown fish. Hopefully. At least it looks more appealing than the boring Good Dinosaur. If this is a HODOR type situation...Imma not be all right.